Once upon a time, this blog had posts that weren’t about Apple and automation. In those halcyon pre-Twitter days, I would actually write full blog posts about things I’d seen and done instead of tossing out a tweet or two and calling it a day. This past Saturday, my wife and I visited the Garfield Park Conservatory on the West Side of Chicago. We’ve gone there many times before, but always in the winter as a way of seeing some greenery and color during the gray months. This time, in addition to the usual wandering through the various houses, we had a particular plant we wanted to see. 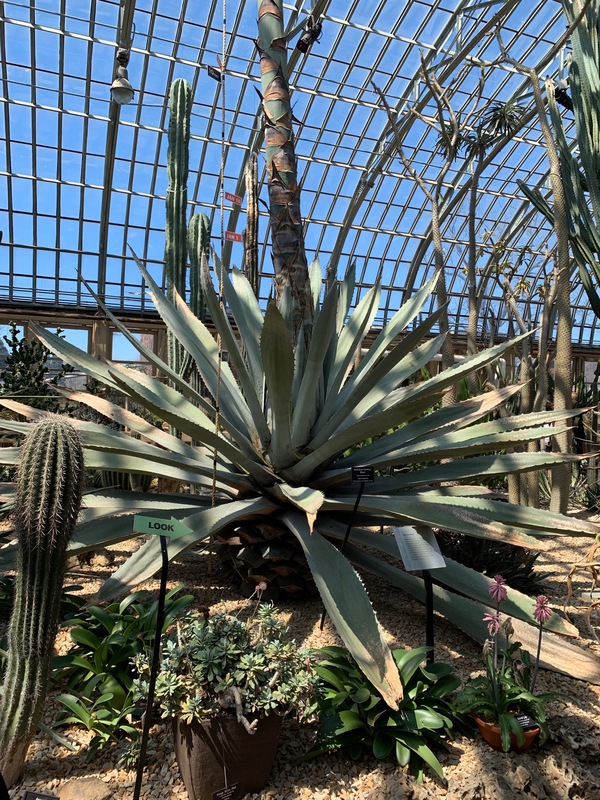 The conservatory’s Century Plant, which has been on display for over 50 years, started to shoot up a stalk in January, not too long after our last visit. This is the beginning of the end for the Century; when its stalk stops growing, it will flower for a few months and then die. The bottom of the plant looks pretty much like it did last year. The difference is the 6″ to 8″ thick stalk growing up out of the center of the plant. If you zoom in on the photo, you can see the rope that the conservatory staff has hung from the roof of the greenhouse to track the growth of the stalk. They couldn’t ask the plant to stand up against a door jamb. The red JAN 1 and JAN 15 labels show about a foot of growth over those two weeks. How tall is it now? This was my best attempt to show the whole stalk with the labels turned toward me. Unfortunately, this missed the tip, which I had to get from a different angle. 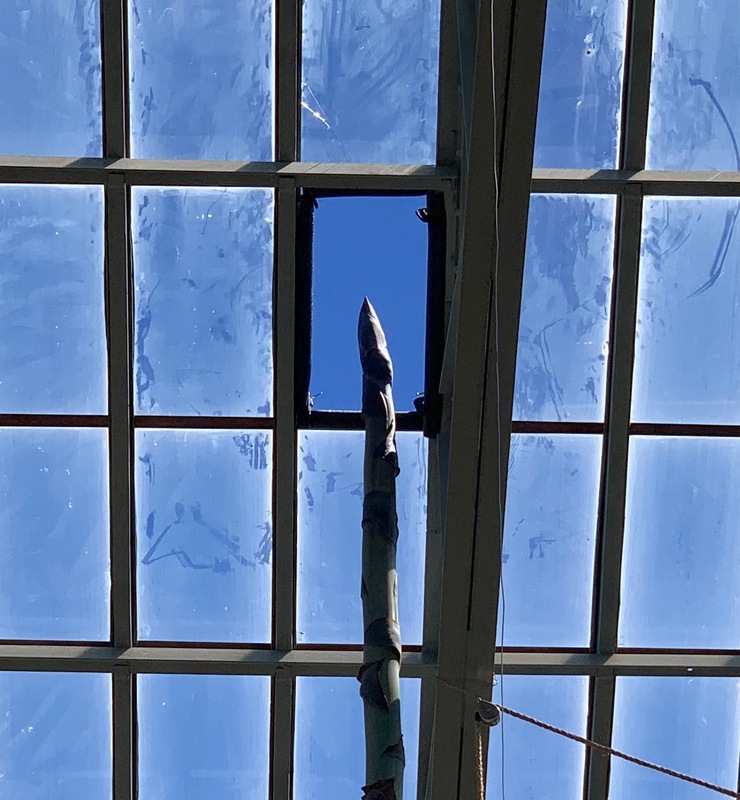 When the stalk got over 25′ high, the conservatory staff had to remove one of the glass panels in the roof to let it out. You can see also that it’s outgrown the rope they were using to track its growth. The conservatory posted a funnier photo of the tip on its Instagram feed. #AgaveWatchGPC update. As of yesterday she is 14 inches through the roof! It looks like it’s poking its head out to take a look at the fieldhouse dome. Last week, Guilherme Rambo was the the unofficial guest on every Apple-centric podcast. His inside information on what’s coming in macOS 10.15 and iOS 13 gave everyone something to anticipate, dread, or argue about. I want to talk about his last revelation of the week, that Shortcuts is coming to the Mac and what I hope that means. OK, “support for Siri Shortcuts” may simply mean that apps will be able to suggest voice activation of certain actions. To me, this is the least interesting part of Shortcuts, because it’s basically limited to the automation of single steps. To be sure, these single steps sometimes take several taps or swipes to get at, so their activation with one “Hey Siri” is a real benefit, but they’re nowhere near as useful as the more complex combinations you can achieve through the Shortcuts app. Here, the prediction is for the Shortcuts app itself, which would be much more useful, but it’s weakened by “likely” and “strongly suggests.” Rambo seems to be drawing an inference about the introduction of a Mac Shortcuts app rather than having a source saying it’s coming. According to sources, only Marzipan apps will be able to take advantage of the Shortcuts support on macOS. Here we have actual sources, but it’s not clear what aspect of Shortcuts is being discussed here. My guess is that it’s just Siri Shortcuts, not a Shortcuts app. And of course, there’s the disappointing—but not surprising—limitation to Marzipan apps only. At the base of macOS is Darwin, a BSD-style Unix. This can be scripted by all the usual Unix tools: Bash, Zsh, Perl, Python, Ruby, and so on. Sitting on top of that is all the Mac-like stuff, which gets scripted by AppleScript (ported over from the classic Mac OS) and Automator.1 The ability to script at both levels is very nice, but what makes this system so flexible as an automation environment are the connections between the two environments. AppleScript can pull up Darwin-level information by running shell scripts through the “do shell script” construct, and Automator can do the same through the Run Shell Script action (Jason’s killer feature.). 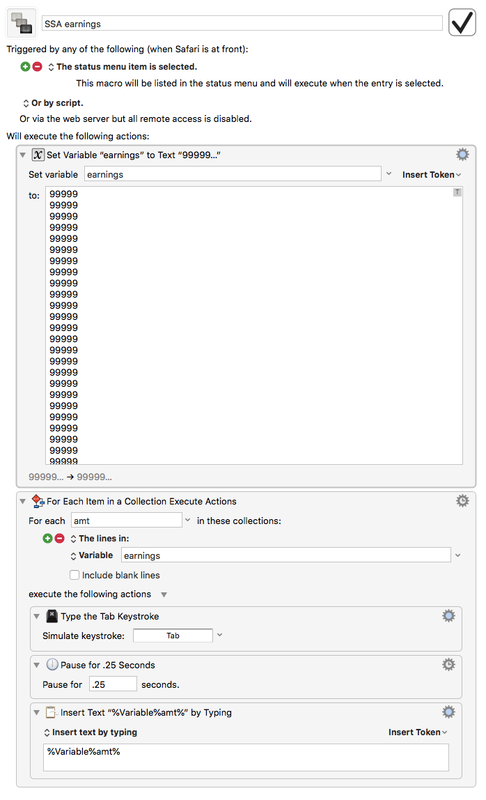 Just as important, though, is the ability for scripts at the Darwin level to access Mac-level information by running AppleScripts via the osascript command and Automator workflows via the automator command.2 Users can create their automations at the level that seems the most appropriate, confident that they can reach up or down to get whatever they need. When Marzipan gets layered on top of the Mac and Shortcuts comes along to automate it, we’ll have this situation. The big question is how will Shortcuts connect to the layers underneath it. Jason’s concern about the upward-pointing arrows along the left side of the diagram—will Shortcuts be able to run scripts and access the resulting information from the Macintosh and Darwin levels?—worries me, too, but I’m just as concerned about the downward pointing arrows along the right side of the diagram. 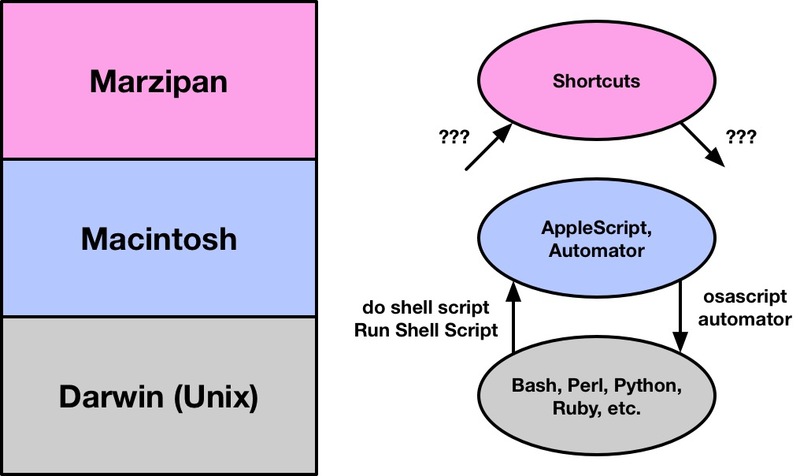 Will AppleScript and shell scripts be able to run Shortcuts and access information from Marzipan apps? My concern stems partly from my overall belief that an automation environment that shares in both directions is the most flexible. More specifically and selfishly, though, I have current automations that run in both directions, and I’m worried that those will be killed off if the main Mac productivity apps go Marzipan. For example, my system for sending and following up on invoices at work, which I discussed in this post and this episode of the Automators podcast, uses Keyboard Maestro to call a Python script that runs a couple of AppleScripts—it runs up and down both sides of the current diagram. If the Contacts and Reminders apps on the Mac become Marzipan-only and don’t give me connections between the upper and lower layers on both sides of the diagram, that system will stop working, and I will be very angry. The people who built Unix understood the value of passing information back and forth between processes, and they gave that ability not just to C programmers but also to regular users through pipes, redirection, and shell scripting. The NeXT developers who built the Mac’s current OS maintained that tradition and extended it from the command line to GUI apps by hooking into AppleScript and Apple Events with osascript and do shell script. We all know, though, that latter-day Apple has blown hot and cold on user automation and on opening up interprocess communication to the rest of us. The introduction of Shortcuts at last year’s WWDC suggests we’re currently in a hot phase, and I hope the connections necessary to make Shortcuts on the Mac a truly valuable tool get made before interest cools again. My PCalc setup tends to stay the same for long stretches of time—it’s a stable app, and I’ve settled into a comfortable way of using it. But I did make some small adjustments a couple of months ago and thought you might be interested. Apart from a little rearranging of the gray buttons, the main change is removing the gamma function (which I never use and had in there only because it fit as companion to the factorial) and replacing it with a combination function, yCx. It’s in the second row, third button from the left. 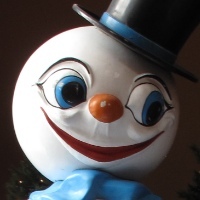 I say “a combination function” instead of “the combination function” because the built-in combination function, which is in the Special functions group, organizes its input and output in ways I don’t like. The inputs are in reverse order, at least according to the way I think. When I think of combinations, I always think of the total number of items first and the number chosen second. 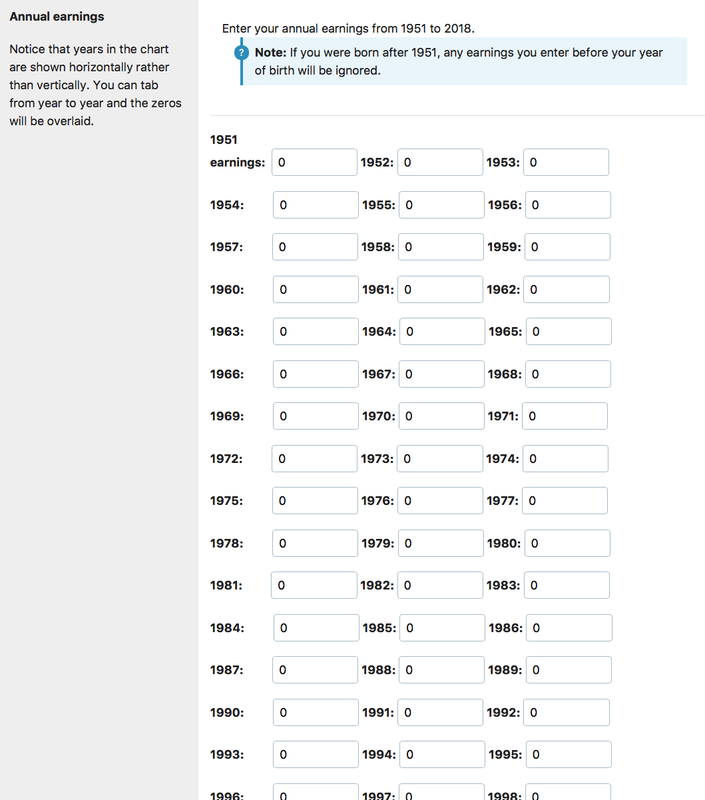 In my head are the phrases “10 items taken 5 at a time” or “10 choose 5.” So my history with the built-in combinations function has been to enter the arguments that way, get an error message, then swap the inputs and redo. I finally got fed up with this and decided that PCalc should bend to my will rather than the other way around. 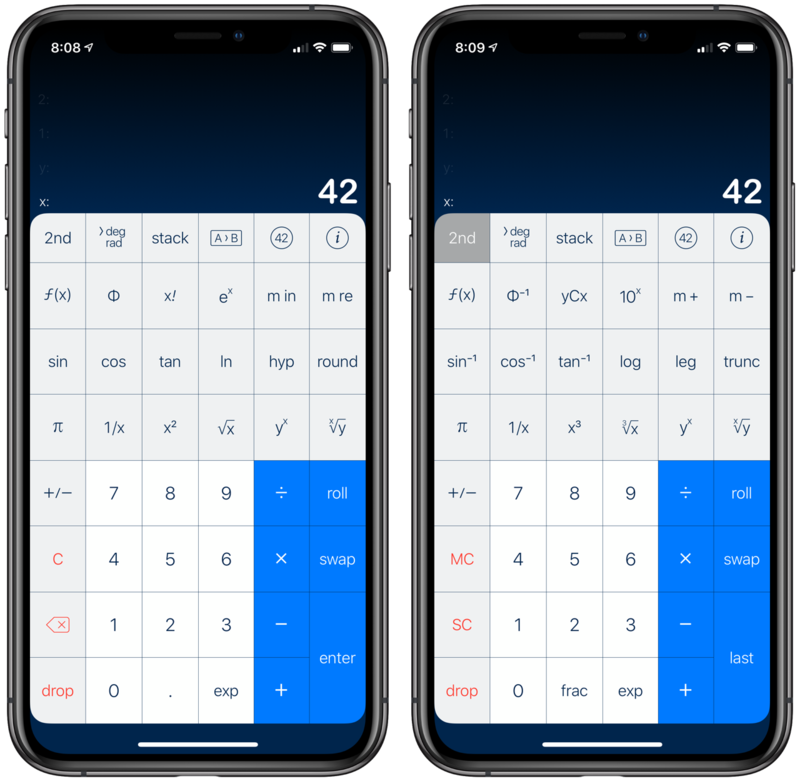 The output is just one number, but PCalc gives me two. 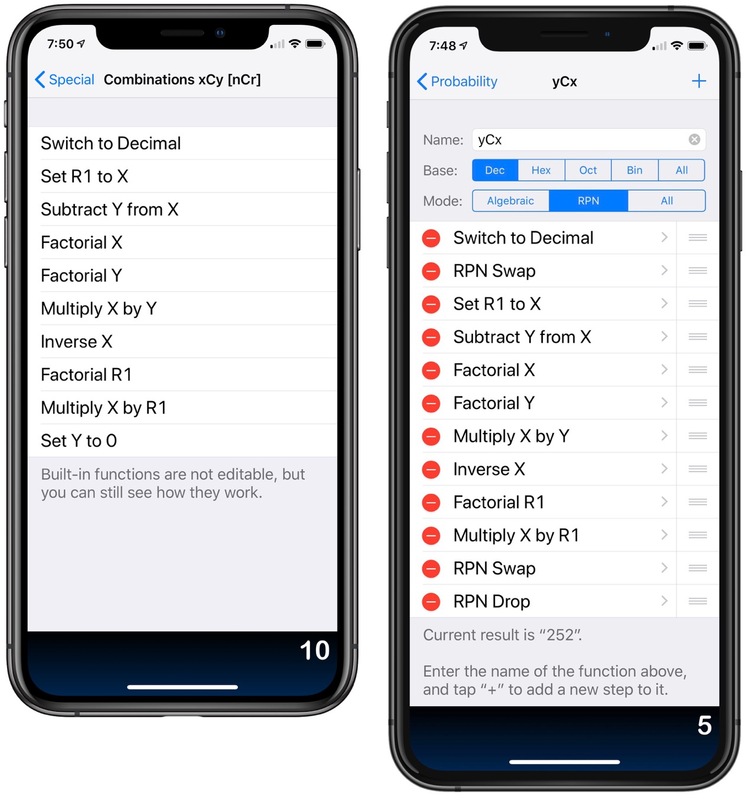 I can understand why James Thomson, PCalc’s developer, did it this way, because built-in functions should accommodate both Algebraic and RPN modes and there’s a symmetry to having both the input and output with numbers in the x and y registers. But I don’t use Algebraic mode, and the extraneous zero in the y register gets in the way of other items I may have further up the stack. Again, PCalc isn’t the boss of me. 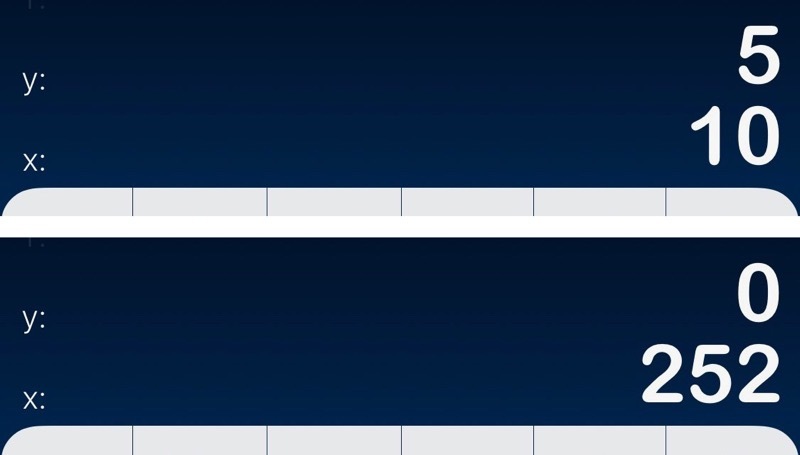 As you can see, I just stole James’s code and changed the beginning and ending bits to match my preferences. On my iPads, PCalc is usually my Slide Over app, ready to be pulled out from the right side of the screen whenever I need to do a quick calculation. The layout is stretched vertically a bit more than I’d like—especially on the 12.9″ iPad, as shown above—but I haven’t felt the need to customize it for this use. I may be unusual among PCalc users in that I use it as a calculator instead of an AR gaming platform. 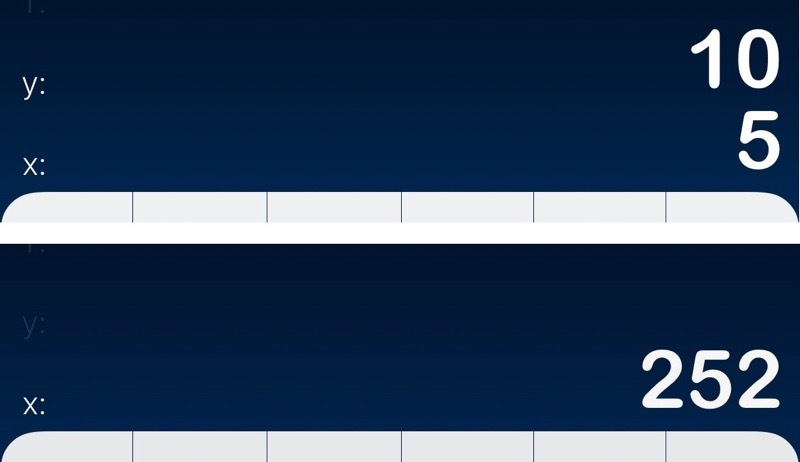 Despite the many other options I have for crunching numbers on iOS, it’s the app I turn to most often.